Cop show Blue Heelers gets a makeover by turning up the heat, writes Michael Idato. As Seven's top-rating police drama Blue Heelers marks a decade on Australian TV, it stands at a crossroads. Perhaps no longer the most popular drama, Blue Heelers is still one of the most successful and certainly one of the longest running. Its characters—dependable Tom, dashing PJ and angelic Maggie—have become iconic. Its personality, however, is defined by safe, uncontroversial storytelling and an uncomplicated view of the world. All that is about to change. The next six weeks will redraw the landscape of tranquil Mt Thomas in a manner that will render loyal viewers speechless and, executive producer Gus Howard hopes, rope in a few hundred thousand new ones. "We honestly felt that we were losing our grasp on the audience, and that, from the audience's part, that could be regarded as a lack of relevance," Howard says. The writers have recently dabbled, he says, with ambiguity, dappling the scripts with uncertainty and even a little darkness, a change for the usually gentle Mt Thomas. "Over the production break, while we had some time to think about things, we felt we had to do more, we had to find a way of reaching the audience we know we can reach, and try to get them on the terms that they approach the real world today," he says. The results of this rethink are evident in this week's episode. When tension between the cops and the newly arrived Baxter family—Barry (Danny Adcock) and sons Troy (Ben Mingay) and Matt (Winston Brearley)—erupts into conflict, there are devastating consequences. 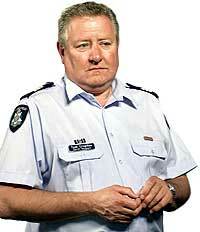 At the heart of Blue Heelers is the world view of Tom Croydon, the station sergeant played by John Wood. As Howard puts it, Croydon believes "the truth can and will be found, that there is a difference between black and white, right and wrong, and that people should be protected from evil". Changing the tone and direction of the series, Howard says, involves changing that world view, and that meant coming up with a storyline that would leave Croydon a profoundly changed man. Some of those changes have already been leaked, including a bomb blast that destroys the police station and claims two lives. That tragedy is followed by a brutal murder that has far-reaching implications for the small community and its police chief. "We have confronted Tom with a force of evil so strong that he feels he can only meet it with an equal and opposite force," Howard says. "What Tom decides to do is just go for these people." In coming weeks, viewers will see the return of former Blue Heeler Nick Schultz (William McInnes), now a homicide detective, and the introduction of a handful of new cops, including Sergeant Mark Jacobs (Geoff Morell), Detective Amy Fox (Rachel Gordon), Constable Kelly O'Rourke (Samantha Tolj) and Constable Joss Peroni (Danny Raco). It is an opportunity, Howard says, to exploit the real power of scripted drama to examine the human condition. Other genres, notably reality TV, use the tricks of drama to draw viewers, he adds, but the pay-off is never there. "Reality TV is edited like drama, it uses cliffhangers like drama, it pits real people against each other the same way drama does," Howard says. "It's just that its outcomes are not dramatic outcomes. They are only everyday-level outcomes and, to that extent, while it's very engaging, it is the human condition at a pop level. It pits archetypes against archetypes and results in archetypical conclusions." For scripted drama to move forward, he says, it can no longer merely mirror our lives. "It still must, should and rightfully deal with those things which are too complicated in life for us to fully understand but which, on contemplation, might teach us a little bit about the human condition. Any drama that sheds light on the human condition is doing a good thing, and that's what we've always tried to do on our show." This is not the first time Blue Heelers has found itself at a crossroads. When the series farewelled Constable Maggie Doyle (Lisa McCune) in 2000, many felt it could not survive the departure of its most popular star and the romantic chemistry she shared with Martin Sacks, who plays PJ. It did, though in recent years the audience has drifted to the more popular CSI franchise, the first program in a decade to topple Blue Heelers from its pedestal. The imminent dramatic overhaul is, in many ways, a response to that, as well as an attempt to find a younger audience. Wood, who has played Croydon for a decade, welcomes the change, but concedes there are risks involved. Croydon's rage against the Baxters, for example, must eventually subside. "He has to find some way of living with himself, doesn't he?" Wood says. "At this stage, there is a bit of debate going on in the script department about how Tom moves into the future, and the big danger, of course, is with that level of rage, or any emotion really, it tends to become monotonous after a while. You've got to be careful you're not writing the same stuff over and over again." It is, he says, refreshing to buck the TV tradition of unchanging consistency. "There is a tendency with TV characters … they are born in that first pilot and they often don't develop. I don't think that is true of this show, though. I think the characters have managed to breathe and grow in all sorts of ways." At the same time, he admits the process has been challenging. "For the first time in literally nine years, it hasn't been second nature. I've just had six weeks of spending a lot of time thinking about where Tom is and where he is going. In a way, it's been like rehearsing a play—you have to learn a character and perform it for an audience. I hope the audience comes on the journey with us."